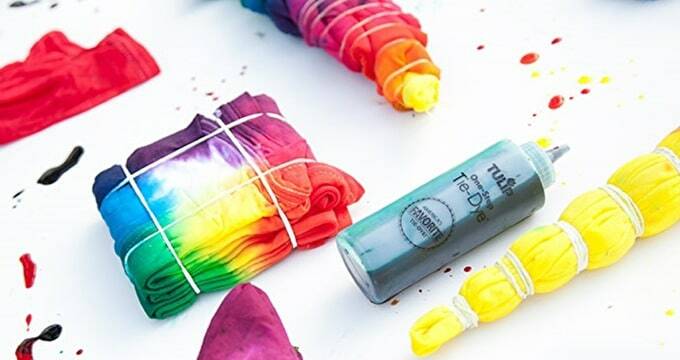 The Tulip One Step Tie Dye Kit allows you to create on trend, vibrant fashion pieces of your own. These one-step kits include the dye pre-mixed in separate bottles, all you need to do is add the water and get dyeing. You can design and dye any piece of clothing or accessories with these three dyes and the 14 different techniques included in the pack. 3rd October 2017 Reviewed by Michelle Townsend These were bought as a gift, so I can't comment on their actual use. 15th June 2017 Reviewed by Jenny Moyse Will use to tie dye T shirts. 6th December 2016 Reviewed by Tony Irwin Just follow the instructions! my grandkids are 3, 6, and 9 - we were trying 'spiral' dyeing (see it on Youtube) and the results varied but all looked great! Easy to use - I had white cotton t-shirts - and the dye worked very well with them.